UltraMon is a utility for multi-monitor systems, designed to increase productivity and unlock the full potential of multiple monitors. With additional window buttons, you can quickly move windows or stretch a window across the desktop. Use the Smart Taskbar to manage more applications, with a taskbar on each monitor and each taskbar only showing the tasks from the monitor it is on. Shortcut extensions make it easy to position applications on the desired monitor. The UltraMon screen saver and wallpaper manager make it possible to use a different wallpaper and screen saver on each monitor. 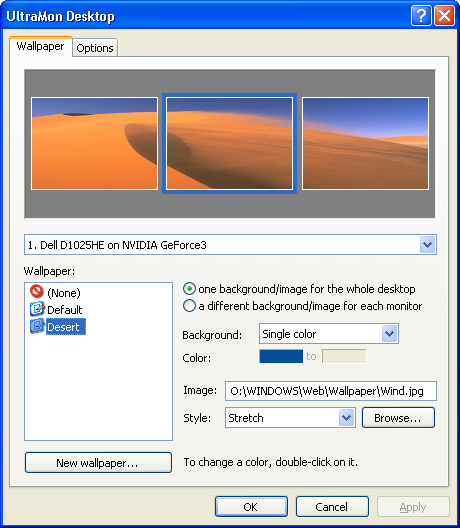 It also includes a flexible mirroring feature, with support for mirroring one or more monitors, and use different resolutions for each monitor. i have to agree.. windows manager came along and made this program obsolete. was good while it lasted thoug! Still beta. Man up and release this thing. Grow a pair. Wow almost 3 years on beta. Indispensable for multiple monitors! Very excellent software - solid, dependable, and excellent features. Ah excellent! The button lag has been fixed. This keeps getting better and better. Indispensible on a multi-monitor setup. Christ, this "update" has been out for a long time. This program is excellent if only for its smart taskbar setting. Windows buttons integrate correctly with Aero theme. Beta is GREATLY improved. I love that I can't make it crash anymore. All in all great release! Had to update my review and lower the score, sorry Ultramon I love your skin support, but I just got hit with a painful bug. Appearently the smart taskbar doesn't support processes started under another account with the runas command. I was using this with my old CRT's back in the day. Now I use CineMastery on my new quad screen array from CineMassive Displays CineMastery appears to be some sort of more modern upgraded variant of the older Ultramon I knew and loved. Wonderful stuff. Works beautifully.